Imagine being debt free. No more irritating phone calls, collections letters, garnishments, or worry about repossession. If you face debilitating debt for any number of reasons, Chapter 7 bankruptcy could be an option for you to hit the financial reset button. Chapter 7 allows you to keep certain assets while you permanently discharge your debt. Whether you fell on hard times due to a divorce, injury or any other circumstances, relief is available. At Lawrence & Associates, we can help determine if you are eligible for a Chapter 7 proceeding. We understand the stress of financial hardship, and we can work with you to determine your eligibility and get immediate relief for your debt. Our northern Kentucky bankruptcy attorneys have extensive experience in Chapter 7 proceedings, and we are passionate about helping people- just like you- who want to improve their financial future. Bankruptcy proceedings can be complicated, and if you try to take action on your own, a simple mistake can jeopardize your ability to recover and can even have more severe consequences. Do not try to take on our Federal government alone! At Lawrence & Associates, we are here to help, and we will work closely with you to craft a strategy for success in your situation. Navigating the intricate rules surrounding a bankruptcy proceeding can be complicated, and an experienced bankruptcy attorney at Lawrence & Associates will take the guesswork out of the process. To determine eligibility, for a Chapter 7 bankruptcy requires a “means test.” The means test will demonstrate to the court that you are unable to pay your debts, and we can conduct the test for you here at Lawrence & Associates. The means test is a way of multiplying out your monthly income to show that you cannot afford to make your debt payments. The means test can get tricky when property exemptions come into play. While the federal court system governs bankruptcy proceedings, each state has a different list of assets that can be made exempt from your bankruptcy. Exempt assets do not need to be included in your means test when you establish your inability to make payments. This means that you can also KEEP those assets, but you need to know the laws surrounding this process to do it properly. If you suffer from debt in the northern Kentucky area, Lawrence & Associates can quickly and accurately conduct your means test and get you on track to financial relief. Once we establish that you qualify for a Chapter 7 proceeding, we can strategize your personalized path to debt relief so that you can keep the assets you need. The process that allows you to keep certain assets under a Chapter 7 bankruptcy is called “reaffirmation.” Reaffirmation means that you will need to bring the payments for those assets current, and then sign a new agreement that states you will keep making, or “reaffirm,” those payments. It is crucial to receive the guidance of an experienced bankruptcy attorney in this process so that you do not make any mistakes. At Lawrence & Associates, we help you with the entire reaffirmation process so that it goes appropriately and smoothly, including the preparation and filing of all required documents. Why Choose Lawrence & Associates? At Lawrence & Associates, we are dedicated to helping the financially distressed get a fresh start. Our firm is made up of a team of experienced legal professionals who have assisted hundreds of clients with Chapter 7 bankruptcy proceedings so that they can resolve debt trouble. Our northern Kentucky bankruptcy lawyers are highly respected in the legal profession, and we represent our clients with diligence and respect. We understand what it means to be in a position of financial distress, and we have a genuine concern for your financial health. Lawyers at Lawrence & Associates know that bankruptcy is not your only concern; we know that you want to rebuild your life as fast as possible. That’s why, with our services, we truly go beyond the paperwork process and devise a plan for you to achieve financial stability specific to your situation. We treat our clients with the respect they deserve, and we have the knowledge you need to move through the legal process and start over with confidence. Chapter 7 bankruptcy is a type of financial relief that allows qualified individuals to clear their debts by granting a trustee to collect their assets and sell non-exempt items to pay existing debts. To qualify, courts first use a means test that will show that your income and other assets are below a certain level. This is measured by the median income for your size of household, in the state where you live. The means test shows that you lack the extra income to pay your debts. Once you establish your that your income is below the median for your state, you will be eligible to begin Chapter 7 bankruptcy proceedings, so long as you have not declared bankruptcy in the past eight years, and you do not have any property immediately subject to seizure. Once you establish eligibility, we will determine which of your assets are available to sell, and which assets are exempt. In many cases, all of our client’s assets are exempt and will not be subject to sale. 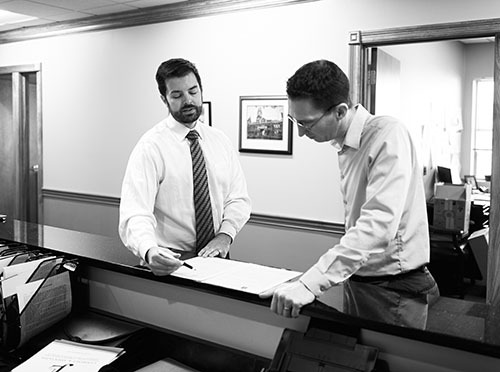 Our team at Lawrence & Associates will work with you individually to determine the status of all of your assets. Unlike other forms of bankruptcy proceedings, Chapter 7 allows you to keep certain non-exempt assets like your home, furnishings, and vehicle. These possessions can be kept through a process called reaffirmation. Reaffirming possessions requires you to bring payments on those items current, and then you will sign a new agreement where you promise to continue payments on those items. Once you reaffirm an asset, you cannot use that in any future bankruptcy proceedings for a specified period. Once we begin your bankruptcy proceedings, you will receive automatic relief from creditors: no more collection calls, letters, or any other legal actions to collect debts. Chapter 7 proceedings can also halt foreclosures, wage garnishments and the repossession of other items. This stay will remain in effect throughout the filing process, and we can finalize your case in as little as three months. To determine if you are eligible for Chapter 7 bankruptcy, courts use a “means test” to show that you do not have enough disposable income make minimum payments on your debts. Anyone in the United States can file a Chapter 7 bankruptcy case, so long as you have not recently completed another bankruptcy proceeding. Chapter 7 bankruptcy is shorter and removes your debts, while Chapter 13 bankruptcies set up payment plans for your debts over several years. Chapter 7 bankruptcies require that you meet stricter qualifying criteria, and Lawrence & Associates can review this with you to determine which option may work best for your needs. Can Chapter 7 bankruptcy save my house from foreclosure? Chapter 7 bankruptcy can temporarily stop foreclosure proceedings, and at Lawrence & Associates, we can review the next steps with you in your situation. In many cases, our clients can keep their homes when filing for Chapter 7 bankruptcy. Can Chapter 7 bankruptcy stop my car from being repossessed? Your car can be repossessed during a Chapter 7 bankruptcy if your car loan lender receives permission from the court. This is a scenario where professional legal representation by Lawrence & Associates can be of assistance, so if you are worried about your car, or any other assets, please call us to discuss your circumstances. What happens if my spouse files for bankruptcy? Your spouse is eligible to file for bankruptcy even if you do not. However, things like your income will be taken into account to establish a complete picture of your household income. These are the types of specific situations that we review on a case by case basis at Lawrence & Associates, so call us for a free consultation about your situation. Does Chapter 7 bankruptcy eliminate all debts? While debts of any amount are dischargeable under Chapter 7, some debts cannot be discharged. The most common of non-dischargeable debts are child support, spousal support, student loans and debts listed in a previous bankruptcy. There are several other less common types of non-dischargeable debts, and Lawrence & Associates can review these with you. Between Chapter 7 and Chapter 13 bankruptcies, which is the better option? Chapter 7 and Chapter 13 bankruptcies are designed to provide different types of relief to debtors. There is no single answer for which option is preferable; it comes down to your situation and overall needs. Call Lawrence & Associates for a free consultation today to discuss what will work for you. Call Lawrence & Associates today at (513) 351-5997 to discuss your options for getting out of debt. We offer affordable services and take payment plans, but your initial consultation is always free. We’ve helped countless others just like you move on with their lives and put financial stress behind them, and we’re ready to help you do the same.